What Does Intergenerational Work Entail? 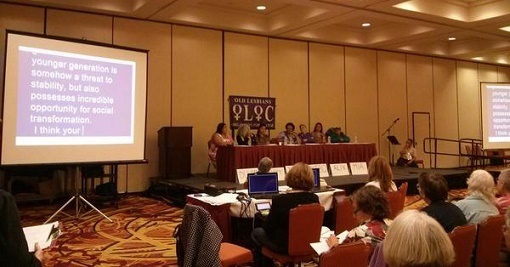 Last month, I went to the Old Lesbians Organizing for Change conference and spoke on the intergenerational panel. While I was very aware of being the youngest person, I was proud to impart some of my wisdom on the topic of “intergenerational work.” When we were asked, “What does intergenerational work actually entail?” I felt fully equipped to answer this question because intergenerational work is what API Equality – Northern California has been working towards all year long! I asked the volunteers on our Leadership Team the same question. What does intergenerational work entail? It’s true. Intergenerational work doesn’t stop when your events are attended by 20-year-olds and 60-year-olds (and everyone in between). There is an immense amount of work that needs to happen with our communities and between our generations in order to truly move our work forward. It has taken me a year to embrace this and realize the great power it can hold for our movements. Originally, the Dragon Fruit Project focused on interviews with older generations; however, recently the project has expanded and embraced the tagline “History is now”. So in that spirit, I interviewed Patricia, an API Equality – Northern California intern who is 19. I asked her questions about her family, religion, relationships and community. There was some laughing and tearing up on both our parts, because that is what happens when we talk about the important and often vulnerable parts of our lives. I identified with Patricia’s struggles around her mixed race identity and was surprised at how early on she knew she was queer. I felt more connected and wiser after our interview. She reminded me that history is dynamic and that we are creating it now. Intergenerational dialogue is nourishing to me and I want more! I value the Dragon Fruit Project because it is an opportunity to honor community members who paved the way for our current activism and raise up the stories of the next generation of leaders, acknowledging that history is dynamic. In this way, listening deeply and preserving stories is a form of love. The impact of the Dragon Fruit Project spans intergenerationally. By sharing our stories and engaging with each other on what it means to be LGBTQ and API in the past, present, and future, we are reclaiming our histories together. Everyone can celebrate the Dragon Fruit Project and the community it simultaneously honors and nurtures.